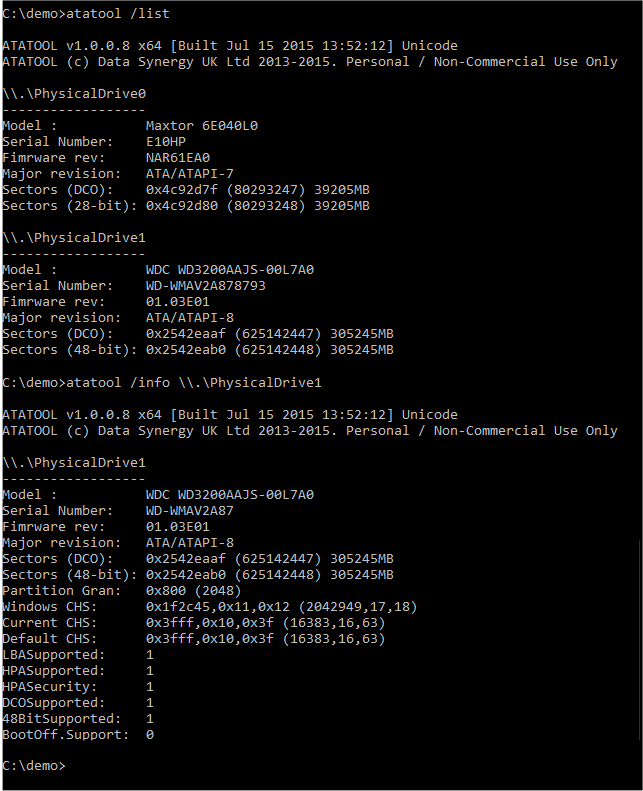 Data Synergy ATATool can be used to display and modify ATA disk information from a Microsoft Windows environment. We believe this is a unique capability for a freely available tool. The principal use of ATATool is to check/modify the ATA 'Host Protected Area (HPA)' and 'Device Configuration Overlay (DCO)' features. It can also be used to simulate 'bad' sectors by corrupting disk ECC data. ATATool is command-line tool. It is supplied as a single EXE file and requires no external dependencies to function. This software can be used to permanently modify the configuration (including size) of a device. This may prevent access to data that was previously accessible and may result in permanent data loss. This tool should be used with great care and Data Synergy accepts no liability for any loss resulting from the use of this software. Please contact us to discuss commercial usage. In some cases (for instance, academic or law enforcement/ISO17025) this may be granted free-of-charge.